C1123. 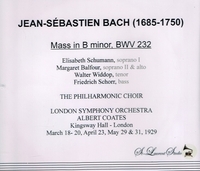 MASS in b (Bach), recorded 1929, w.Albert Coates Cond. London S.O., Philharmonic Choir, w.Elisabeth Schumann, Margaret Balfour, Walter Widdop & Friedrich Schorr. (Canada) 2–St Laurent Studio YSL 78-089. Transfers by Yves St Laurent. “Coates, born in Russia in 1882 to a Russian mother and a British father, came to maturity during the reign of Czar Nicholas II. He walked several miles through the snow to attend Tchaikovsky’s funeral, and in the early years of the 20th century he became one of Arthur Nikisch’s star pupils and later, his assistant. Nikisch saw what he had to work with and smiled: Coates was a big, brawny man who sometimes let his emotions get the better of his technique. Disgusted and disillusioned by the Bolshevik Revolution, Coates left Russia and fled to England, where he quickly established himself as a first-rate conductor. Between 1921 and 1932, Coates made literally hundreds of sides for HMV, including the first electrical recordings of the Tchaikovsky Sixth and Borodin Second Symphonies, the first complete Bach Mass in B Minor (the soloists included Elisabeth Schumann and Friedrich Schorr), lots of Tchaikovsky, an early but incomplete recording of Holst’s THE PLANETS (Coates had given the first public performance of the work in 1920), Ravel’s LA VALSE, Respighi’s THE FOUNTAINS OF ROME (even beating Toscanini to the punch), and other works. Yet it was undoubtedly his long and distinguished series of Wagner recordings, using some of the greatest German and British singers of his day, that put his name on the map. Coates’ 1926 recording of Siegfried’s Funeral Music from GÖTTERDÄMMERUNG was the talk of the day among collectors, just as William Steinberg’s stereo recording of THE PLANETS was a famous test record of the early 1970s. It’s not only beautifully recorded but stunningly performed. Coates combined a linear conception of music with the weightiness of Furtwängler. He was, quite simply, a great conductor. Moreover, W.H. Auden, in one of his articles, once said that he timed several of Coates’ performances of Wagner and compared them to the known timings of Wagner’s own preferred conductors at Bayreuth. Much to everyone’s surprise, it was Coates’ incendiary performances that came closest to the timings of Bayreuth’s original conductors, who probably followed the composer’s directions. Yet the astute reader will have noticed the strange gap: why were there no HMV recordings after 1932? All of a sudden, the label’s indispensable conductor for almost a decade became not only dispensable but ignored. Not one article or source on Coates I have ever read—and I’ve been trying to research him since the mid 1970s—has ever had an explanation for this. Coates was one of the most exciting and vital conductors who ever graced a recording studio….everything conducted by Coates is superb. I might also point out that these recordings are also Hall of Fame material for the singing of tenor Walter Widdop, one of the most underrated Wagner tenors of all time…."